From breathtaking vistas of changing leaves to the radiance of afternoon sunlight that will soon give way to striking ocher sunsets, nature brims with beauty during the fall. The kaleidoscope of hues and textures evident in our surroundings offers inspiration for bringing the splendor of this glorious season indoors. Our latest Victoria Classics issue, Autumn Bliss, includes a bevy of decorating ideas. Now is the perfect opportunity for nesting—enriching your interiors and adding layers in anticipation of the cooler weather to come—and we have a few favorite tips for decorating for fall. 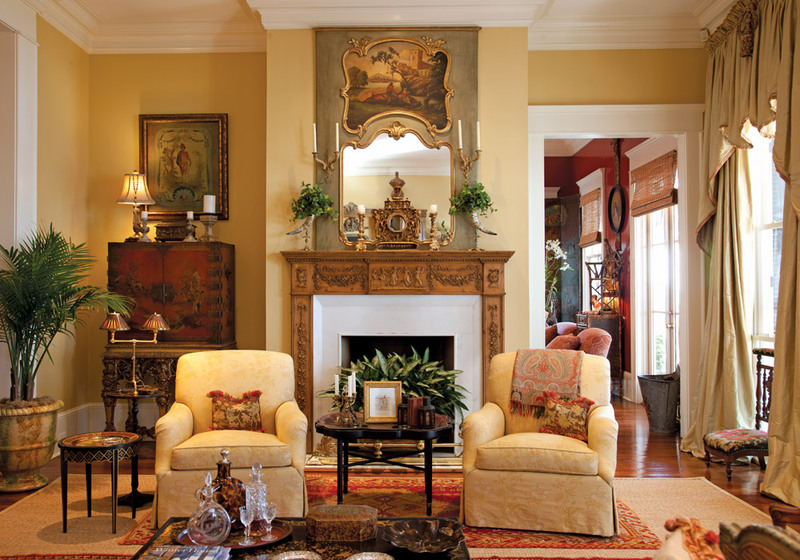 Graced with an eye for color, a sixth sense for proportion, and a self-professed aversion to the word formal, Anita Rankin invites us to explore her lavish—yet livable—waterside home in Point Clear, Alabama. Every room here is arranged with rare finds, and cozy shades accentuate the antiques and timeworn fabrics she appreciates. 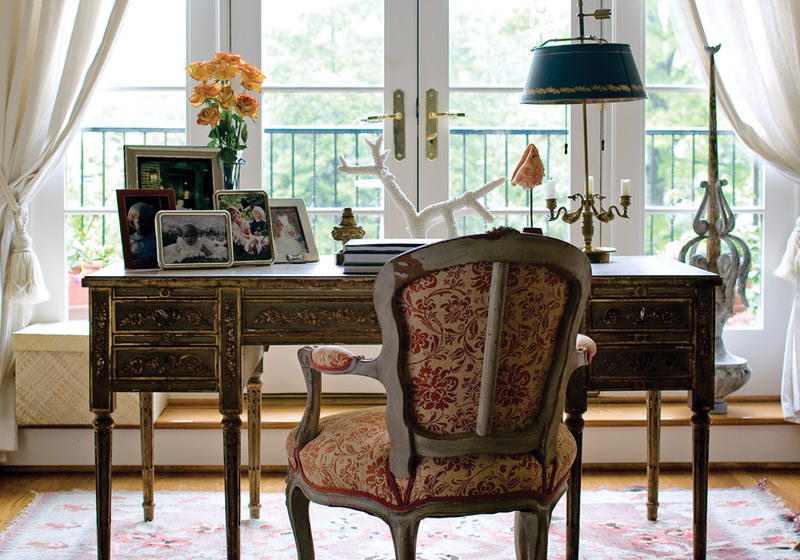 “The woods look gorgeous against warm color—chocolate brown, deep red, my favorite creamy gold,” the decorator notes. Careful placement of each hue allows her artistic vision to flow seamlessly throughout the residence. In another abode featured in Autumn Bliss, treasured keepsakes capture the sentiment of hospitality so often attributed to this season. From polished Old-World antiquities to rustic Americana, objets d’art provide form and function, along with memories of trips to markets such as Texas’s famed Round Top Antiques Fair. 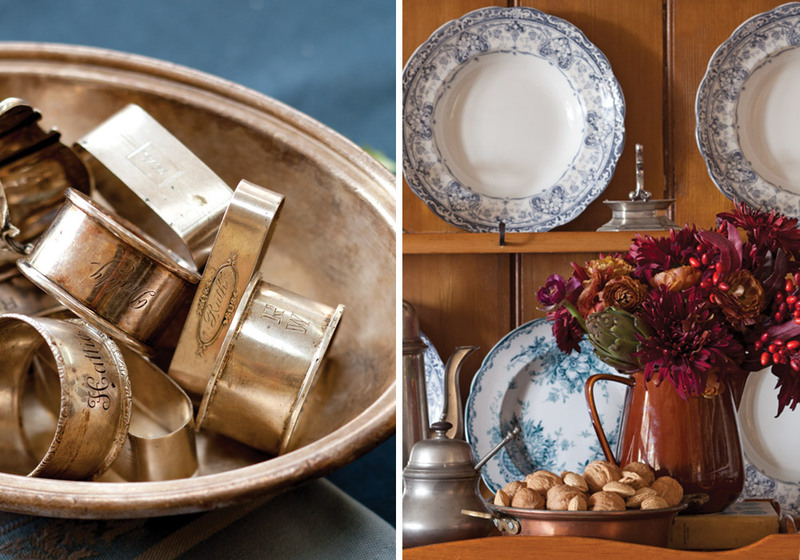 At the ready for entertaining, these accessories need not be tucked away until company arrives. Above, a pewter bowl filled with engraved silver napkin rings makes an intriguing display, while a distressed pine hutch showcases a medley of English blue-and-white transferware and a pitcher overflowing with blooms. The classic Tudor home of Lee Stough, in Louisville, Kentucky, demonstrates the value of cultivating a sanctuary. The verdant hills that lie beyond her property prompted the interior designer to position an 18th-century French desk to take advantage of the view, which is framed by curtains fashioned from vintage monogrammed bed linens. “Whether it is an upholstered wall, a painted finish, or a piece of porcelain, there are always visual souvenirs that serve to energize me,” Lee explains. “I love my home—I love being at home—and my goal is for my clients to experience that same sort of bliss.” Incorporating wisdom garnered during world travels, she uses time-tested palettes and textures to infuse an intangible richness into each space she transforms. 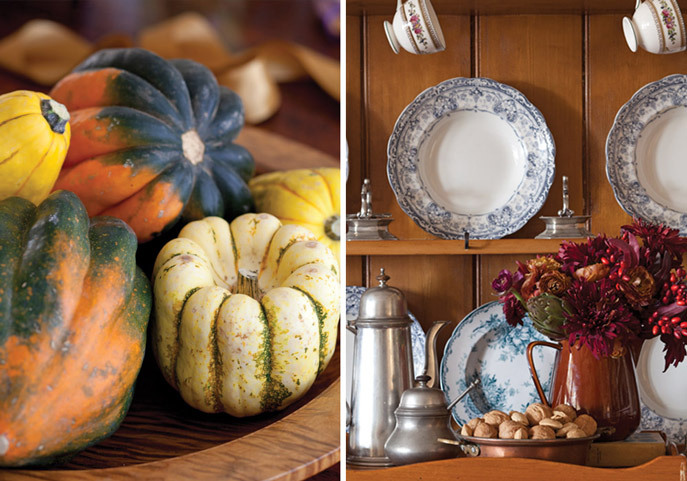 What are your favorite elements of fall décor? I told my children, it’s time to pick a couple of pumpkins out to put on our porch, fall is a wonderful time of the year. I’ll have to check out the latest issue soon such a fun joy the magazine are. I’m always excited for fall and crisp, cool weather. White pumpkins are my favorite! Can’t wait to pick up Autumn bliss! cant believe this is your home. its so beautiful! Pumpkins, gourds, acorns etc. are definitely part of the autumnal decor. I also replace the summer cushions and blankets with heavier ones in fall hues. I too set out all my Victoria autumn issues as well as other books that seem suited to autumnal reading. The season never lasts long enough for me! Bringing out previous gorgeous issues of Autumn Bliss and other Hoffman fall magazines is always part of my autumn decor. The latest edition always takes top spot. They are like old friends. I enjoy them over and over as much as I did the first time I fell in love with each cover and then the contents. They truly make my life more blissful! Thank you, Phyllis. Oh, that blue transferware made my heart skip a beat! All things harvest! Pumpkins, gourds, apples, leaves. Fall is my favorite time of year. Thanks for this inspiring post! Pumpkins, squash, mums, sunflowers, a witch here and there, dramatic fall colors. So glad summer’s over! Such splendid colors are relief from summers cooling pastels.Having a New York state background always creates a warm memory of fall adventures before the snow shovels appear! I love everything about fall. My most favorite way to decorate my home for this glorious season is by using natural elements. I have soft green and white real pumpkins sprinkled amidst the French antiques, branches of leaves in antique French glass demijohns, and potted mums in fall colors. My little squirrel collection comes out, as do the antique English brown transfer ware pieces. I love fall! Different types of pumpkins, I love the sparkler pumpkins with the curvy tops! I like to incorporate all shapes and sizes and colors, makes an interesting focal point in a room…. Most of all lots of warmth! Not to mention my favorite scent of autumn candles! That’s what completes me. I have a little story about Autumn Bliss. Days before my mother’s passing, my friend Connie brought me a card, a devotion, and a copy of Autumn Bliss stored neatly in one of her little bags. She said you will probably want to save Autumn Bliss for later so you can really enjoy it. After she left and sitting there alone I pulled it out to find one of the most beautiful covers I have ever seen. But there is more to the story-my eyes went straight to the pumpkins on a stick in the arrangement. Mother is the only person I know who grew these beautiful pumpkins on a stick. Before she grew them, I had never seen them. I will have to say that the beauty of this cover and the pumpkins on a stick reminded me so of my mother’s beauty that I did have to put it away for later. Recently I have poured over every page of this beautiful magazine. These things can touch our lives in ways that cannot be imagined. I thank you and your staff and my beloved friend Connie. Every year, we grow a variety of pumpkins/squash in our garden. Sometimes we have a marvelous crop and sometimes, it’s minimal. But always, harvesting those colorful, oddly-shaped fruits is a delight, and they bring autumn to my front porch when accompanied by small scarecrows and mini-straw bales. Decorating for fall is great fun; a celebration of the summer that was and the diminishing of garden chores.